The Brewster family may be filled with secrets, but you can make sure nothing about your play will be held back! 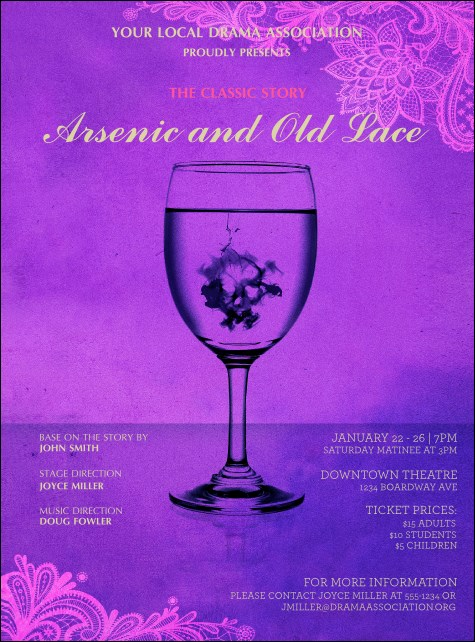 Hand out the Arsenic & Old Lace Flyer and let all fans of the classic story know about your production! The lilac flyer with lace and a soon-to-be toxic drink has 21 lines for every bit of info. The right flyer for any presentation or performance can be found at TickePrinting.com!